Of the three common alternatives for providing access between floors (residential elevators, stairlifts, and platform lifts) the stair lift is by far the least expensive option. Residential elevators and platform lifts will range in price from 10k – 16k and up and are typically not the most conventional alternative. Straight stair lifts range in cost/price from 2.5k – 4k, and between 4k – 15k for retrofitted curved models. As the complexity of the stair design increases so will the installation costs. Curved rail lifts require a highly detailed on-site survey prior to order and can take up to 3 months to be built and delivered. The price of your stair lift will also depend on the manufacturer. Stair Lift Specifics – Special Thanks to www.EazyLift.com for an awesome stair lift guide. Please see it in its entirety here. Drive Type – There are 4 types of stair lift drives available on the market today. Most suppliers retailers sell the rack & pinion variety. Rack and pinion stair lifts have proven, over time, to be the easiest to use with the least amount of maintenance. Cable – Most cable drive systems use a steel cable, like the ones used in elevators, to advance the passenger. Some users have said that the cable based lifts don’t offer smooth transitions in movement. Starts and stops can be abrupt. Chain – Usually only used for heavy duty models. Can be loud at times. Screw – The lifting mechanism used is a screw driven actuator, which is powered by a rechargeable battery. Rack & Pinion – Users ride is smooth and controlled. Speed can be set by installer. Rack and pinion (meaning gear and teeth). The systems must be cleaned and lubricated regularly to prevent damage to the components. Gear teeth can be hazardous, especially to children, but most models have hidden gears. Many manufacturers have discontinued their cable, chain, and screw drive systems, with the exception of their heavy duty models. Rack & pinion stair lifts are the one’s mostly sold and used today. Rail / Track – The track used with a stairlift is secured to the stairs. Steel and aluminum are the primary metals used in manufacturing the tracks. Steel is often used for custom engineered applications, where as aluminum is typically found in straight applications because of its lighter weight and interchangeability. Power – Most stairlifts today are powered by batteries or a domestic mains supply. Either AC (main supply) or DC powered (battery). AC powered units use a trailing mains cable that is said to be less reliable than the DC battery powered units. Furthermore, the trailing cable needs to be reeled out and reeled back in, each and every time the stair lift travels up and down the stairway. AC powered units can be recharged anywhere along the track, whereas DC powered units can only be recharged at the base stations at the top and bottom of the stairs. There are several states where they prohibit the installation of AC powered equipment unless you are a fully qualified electrician. Static Charging – consists of permanent charging stations positioned at each end of the rail. Flexible Charging – allows the charging stations to be moved anywhere on the rail. 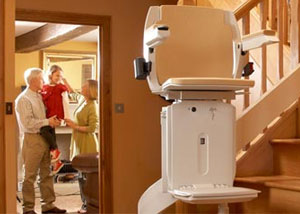 Swivel Seat – To safely access the upper landing of the stairs, one must swivel the stairlift seat onto the landing. A lock release lever allows the seat to turn. Some seats have a single or dual release arms. 90° Swivel Seat – This type of swivel seat is mounted on the upstairs side of the chassis and fold in one direction. 180° Swivel Seat – This model folds in both directions. Diagnostics – Many newer stairlifts like Acorn offer a self diagnostic system that can help diagnose problems with your lift and decrease maintenance costs. Weight Capacity – Most manufacturers offer standard models that can hold from 300, up to 375 lbs. Heavy duty models are also available that an hold up to 500 lbs. Accessories – There are a number of accessories available to complement your Stair Lift. These accessories are great for individuals with additional mobility difficulties and/or more complex stair configurations. Sit and Stand Frame – Allows the passenger to choose between sitting and standing. Seatbelts – Great safety feature with offered in either belt or shoulder strap. Hinged Rail – Allows the railing to be moved from the bottom of the stairs. Bridging Platform – Used for curved staircases at the top of the landing. Power Folding Footrest – For individuals that have a hard time bending down. Power Swivel Seat – Automatically turns the seat for effortless entry and exit. 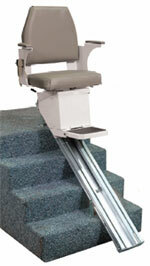 Installation – Many stair lifts are manufactured so they can be easily installed. Some individuals may decide to install it themselves while others prefer to have them installed by the manufacturer. Most stairlift manufacturers will have measurement and installation guides readily available on their websites and are very helpful if you have any questions. See here. So which is better AC or DC Power, Rack and Pinion or Cable Driven: Well here are the statements made from two of the leading manufacturers of stairlifts. Acorn and Ameriglide/Summit – Take a look at each and you make the decision. Does Medicare help with the cost of a stairlift? Unfortunately, Medicare does not consider a stair lift to be a medical necessity, so they currently do not cover this particular mobility device.